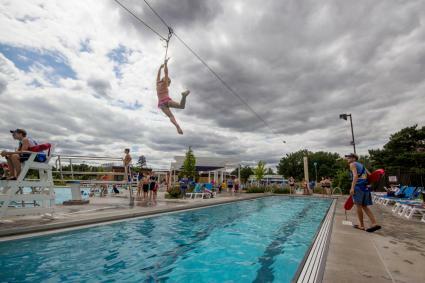 Como Regional Park Pool features a zip line, lazy river, aquatic climbing wall, children's pool, six-lane lap pool, diving platforms and more. *Groups of 25+ can get an additional $.50 off per ticket if they call ahead. M-F from 5:30-6:30pm either Lap Swim or Water Aerobics uses the Lap Pool and only the Dive Well, Children’s Activity Pool, and Lazy River are available for Open Swim. Open Swim will resume in the Lap Pool at 6:30pm. Morning Water Aerobics are held at the same time as swim lessons and share space with that program. *Closed July 6-7 for a private event. Holiday hours for July 4 and September 2: Lap Swim 9:30am-11am, Open Swim 11am-7pm. Do you love Como Regional Park Pool, Great River Water Park, and Highland Park Aquatic Center? Consider purchasing a membership or punch card for discounted admission rates! Tot Time is from 9:30am to 11:00am on Saturdays. Admission is $8 for one parent and child pair, a savings of $5. Each additional child is $4 and all children must be 0-6 years old. Only the splash pad will be open for Tot-Time swimming. Concessions are closed during this time. Everyone is welcome to stay for open swim at 11:00am at no extra cost. Admission is just $2 on June 21, July 19 & August 6! Interested in birthday party packages, sun shelter rentals, private parties, or other special reservations? Visit our Rentals & Parties page.